Huntington Police continue investigation of a stabbing Thursday, Dec. 22 at about 9:15 p.m. in the 400 block of W. Eighth Street. A 911 caller indicated a victim had been stabbed in the throat. The victim has been rushed to the hospital with serious injuries. Police have interviewed witnesses and a person of interest, WSAZ.com stated. 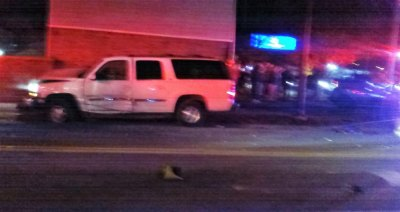 Earlier in the evening at about 7 p.m. an accident between a truck and SUV knocked out power at the intersection of Eighth Avenue and Hal Greer Blvd. The driver of the truck had to be taken to the hospital.